We’d love your help. Let us know what’s wrong with this preview of The Confectioner's Coup by Claire Luana. Wren thought things were bad when her boyfriend's father tried to frame her for murder. But that was before a hostile army showed up at the city gates, ready to swallow Maradis whole. And before guild members began disappearing one by one--including the Confectioner's Guild's newest Gifted recruit. Don't miss this thrilling Book 2 in the Confectioner Chronicles! The Confectioner's Exile is a young adult fantasy mystery perfect for fans of Maria Snyder, Erika Johansen, and Gail Carriger. Don't miss the entire Confectioner Chronicles! To ask other readers questions about The Confectioner's Coup, please sign up. Wow, just wow. There's just no words to explain what I'm feeling right now. I cannot believe what it has taken for this world to become apart of my own. This series so far has made my heart soar, has made my heart jump with fright and fear, has made my heart cringe with awkwardness, it has made my heart sing for joy and it has made my heart broken with sadness and sorrow. This book really hits you hard Wow, just wow. There's just no words to explain what I'm feeling right now. This book really hits you hard with sadness and anger, you'll want to rip your hair out and scream at the screen because of the decisions that many of the beloved characters have done! There's just so much to learn about what happens to these characters, and how to apply it to our own lives. True we aren't trying to dethrone anyone or fight pirates but there are some of us who want vengeance on someone, who want to fight for what we believe in. And sometimes because of our anger, we are clouded by it that we don't see reason and make stupid mistakes. I believe this series has really touched my thoughts. It definitely has made me think about the kind of people we are. And same for Wren and her family, her allies. She and her crew will go through so much laughter and trouble in this book. Finding a new recruit with the Gift, and then fighting for their lives from the King again. It's easy to be lost in this story and how it all unfolds and connects to other events, including Wren's dark past. But will they all be able to resist their strong need for vengeance, will they all stay true to who they are, or will they become someone they don't know ? I have loved every minute spent reading this series, even when I've had to do uni assignments, it has all been worth it. We are left with such an epic conclusion that I can't wait to jump onto the final book! Such a wonderfully delicious series! I was excited to get into the second book after enjoying the first so much. After solving the mystery of her Guildmaster's murder, and acquitting herself, Wren still can't relax. Gifted guild members, including one of their own, are going missing and Wren is determined to rescue them. Once again I could not wait for the final book in the trilogy. After such a great first book, I was afraid the second wouldn't be able to compete. Happily, this book builds on the previous and introduces new complexities to the plot, and among the characters' relationships. One of my favorites with this series so far, is the characters. They have a comfortable camaraderie that makes one think of happy family banter around campfires. But they also have intense moments, where trust and loyalty is questioned. And not all answered as expected. The plot is ever b After such a great first book, I was afraid the second wouldn't be able to compete. Happily, this book builds on the previous and introduces new complexities to the plot, and among the characters' relationships. The plot is ever bit as unexpected and captivating as in the first book. The book was excellently written, with dark political machinations that keep you on the edge of your seat. Wow! I'm blown away with the second book! It was not what I was expecting. The thrills, the love, the betrayals....it was so insane, it incredible! The storyline was even better than the first book, the characters grew and are outstanding and I didn't think the world building could get any better! I'm looking forward to reading book 3! Second novel in this series; and it has it all. High action, romance, happiness, vengeance, emotional trauma and a cliff hangar. This novel really tests the characters that we meet in the first novel. We are also introduced to new characters that are integral to this world. Claire is one of my favourite authors. She really knows how to create an amazing world as well as fantastic characters. Published November 19, 2018, by Live Edge Publishing The Confectioner's Coup by Claire Luana is the second novel in her YA fantasy Confectioner’s Chronicles that follows Wren on her most daring adventure yet. What an amazing sequel. Following Wren the novel also switches to Hale’s POV, giving the story a broader scope and more depth to the characters and their dynamics. Admittedly, since the story is changing the formula and bringing another character’s point of view into the mix, the story does Published November 19, 2018, by Live Edge Publishing The Confectioner's Coup by Claire Luana is the second novel in her YA fantasy Confectioner’s Chronicles that follows Wren on her most daring adventure yet. What an amazing sequel. Following Wren the novel also switches to Hale’s POV, giving the story a broader scope and more depth to the characters and their dynamics. Admittedly, since the story is changing the formula and bringing another character’s point of view into the mix, the story does slow down. It catches the reader off guard because while Hale may have a novella dedicated to him, the idea that the story was going to switch back and forth between the two was unsuspected. While it catches the reader off guard, it is almost as if the story has to regroup and do some character building. Yes, the reader knows of Hale and knows his past, but they do not know who he is now, his motivations and thought process. So for the first half of the novel, while there are tension and character growth there, the pace slightly slows as it gets to the essence of Hale and develops his character for the reader. Now, once the reader passes the halfway mark of the story, however, the pace and tension start to heat up. The action and intrigue continue to quicken as more and more people go missing in a city under siege. The characters are pushed to their breaking points, creating tension and heartbreak for this band of characters. Now that Hale’s point of view has expanded the scope of the novel, the story is more bountiful. The story has more narrative to it, allowing it to flourish in a way that eventually connects the pasts of both Wren and Hale, offering up something so unsuspecting for the reader. The story keeps the reader on the edge of their seats with a fantastic plot and character development. So much happens in the novel that ties the characters together. The twists and turns inspire the reader the feel for the characters, to see how they make their choices that define the movement of the plot while also coming from a place of emotion to keep the reader entranced. A great read about thinking things through. Wren survived the ordeals of the first novel and is trying to resume her normal life. When her and Callidus are on the trail of a Gifted ice cream maker, they are attacked by mysterious men in black. However, the ice cream maker Thom joins them and is a fast friend. As war looms and tensions rise, Guild members start mysteriously disappearing., including Thom. Can Wren and her friends solve the mystery and find Thom before war threatens them all? a grea A great read about thinking things through. Wren survived the ordeals of the first novel and is trying to resume her normal life. When her and Callidus are on the trail of a Gifted ice cream maker, they are attacked by mysterious men in black. However, the ice cream maker Thom joins them and is a fast friend. As war looms and tensions rise, Guild members start mysteriously disappearing., including Thom. Can Wren and her friends solve the mystery and find Thom before war threatens them all? a great read. Well developed plot with twists and turns that I just couldn't put down. I loved the character development of people such as Calliidus, as a kind and caring man underneath it all or Hale not just being a reckless fool which was brilliantly written. Also the King returns as a spinechilling force to be reckoned with. I loved the use of tension throughout the novel, as conflicts arose for Wren in a fantasy world with its own laws and society and politics. I loved the visual detail throughout the novel and the vivid sense of colour in the blues of the lake and the greens of the islands, and also sun and sand in Hales account of his home later on. Or the wedding scenes with colourful bright and detailed dresses against the dark of the black carriages and Black Guards. which contrasted perfectly. The story The Confectioner's Coup (Confectioner Chronicles Book 2) by Claire Luana is a fantasy book. It one that has action, danger, romance, and mystery. I found myself turning pages trying to find out what was going to happen next. It is the next exciting book in a wonderful series. Wren has found herself with a bit of time on her hands. She is someone who has always been busy and it is an unusual feeling. Wren has survived being falsely framed for murder. Now situations occur that have her and others in harm’s way. There is a hostile army outside the gates. Will they take over the city? Members of the Guilds begin to disappear. Wren suspects who is behind the disappearances. Her investigation will have her facing old and new enemies. Will Wren find the truth behind the disappearances? Will she find the missing Guild members? How much danger is the city really in? Read this book to find out. I enjoyed reading about Wren and the relationship that she has with her boyfriend. This book has a bit more romance than the last one. This was a book that was a more emotional ride for me. I have grown to love many of the characters since reading the first book and now with this one I was not only rooting for them to succeed in whatever actions they take but also for them to find happiness in their lives. There are moments of suspense that had me having to tell myself to breathe. I love how the story has plenty of detail and I felt like I was right there with the characters. There are some twists and turns that I did not see coming. Once I started reading, I had a hard time putting down. Highly recommended. The Confectioner's Coup (The Confectioner Chronicles #2) by Claire Luana was just as good as the first and, had me just as engaged and hooked. The second book in The Confectioner Chronicles we are once again tossed back into the fire. With the happenings all concluded in the first and Wren being aquitted for a crime she didn't even commit, things seems like they're on the up. But, with this world and the way their monarchy works, things don't stay quiet for long. I will say that I was a little w The Confectioner's Coup (The Confectioner Chronicles #2) by Claire Luana was just as good as the first and, had me just as engaged and hooked. I will say that I was a little worried that this book may not live up to the first. As that first book was a rare read first installment where things actually concluded, and if the series were to end at that book, even with its loose ends, I would have been content. (As all first books should be). But this book has done what I've been yearning for, it went in and rose the bar. That's right, this book took it up a notch and, man oh man, this was one hell of a ride. Masterfully written this beautiful dangerous world isn't like anything I have read before. It just keeps hitting me with new fresh ideas and plots, that I can't believe this book, this series, isn't more popular. Not only are we treated with talented writing but, the emotions behind that wiriting gets you right in the feels. The character are more than well rounded they're 3D, believable and multi layer, as is the plot. I can go on and on about how utterly amazing this book/ series is, but I'm going to leave you here, so you can hop along and get this book to experience its greatness for yourself. This book gets my highest of high recommendation and my golden stamp of approval. Confectioner’s Coup by Claire Luana is the delicious second book in her newest series, the Confectioner Chronicles. The plot thickens in the latest instalment as an army arrives at the gates of Maradis, and the Guilds are thrown into dismay as the King struggles to gain power over them once more. But the Guild members are tired of answering to a blood thirsty King and his demands for Gifted produce from them. With an army fast approaching and Gifted guild members going missing, Wren must join fo Confectioner’s Coup by Claire Luana is the delicious second book in her newest series, the Confectioner Chronicles. The plot thickens in the latest instalment as an army arrives at the gates of Maradis, and the Guilds are thrown into dismay as the King struggles to gain power over them once more. But the Guild members are tired of answering to a blood thirsty King and his demands for Gifted produce from them. With an army fast approaching and Gifted guild members going missing, Wren must join forces with unexpected allies to help save the missing members and stop the King tyranny once and for all. If only Wren’s life could be a piece of cake, first she’s framed for a murder she didn’t commit and now the possibility of a rebellion and war. The girl needs a holiday, where she can enjoy her delicious baked goods. I really loved this second instalment of the Confectioner Chronicles, Claire’s writing is phenomenal and captivating. She will have you hooked after the first line. All her characters are well developed and constructed, that you can see them as real people. And her descriptions of all the food in this story will have you drooling over your book. Every time I read a passage I immediately start craving baked goods and chocolates, that I have to put the book down and go out and get some. Thankfully I work in a cake shop and chocolate is never hard to come by. Absolutely loved this book and to see how the story continues to get bigger and bigger. I can’t wait to read the third book in the series. I have to say first and foremost that the covers that accompany the series of the Confectioner Chronicles are just stunning. In fact it was the cover of the first book, The Confectioner’s Guild, that first drew me into this series and sucked me into the world that Wren lives in. Like I have mentioned this is a series and The Confectioner’s Coup is the second book. I would read the first book as well as the prequel,The Confectioner’s Exile. I could sit and talk about this book all day. Both story I have to say first and foremost that the covers that accompany the series of the Confectioner Chronicles are just stunning. In fact it was the cover of the first book, The Confectioner’s Guild, that first drew me into this series and sucked me into the world that Wren lives in. Like I have mentioned this is a series and The Confectioner’s Coup is the second book. I would read the first book as well as the prequel,The Confectioner’s Exile. I could sit and talk about this book all day. Both storyline and reasons why I loved it. Each one of these books have progressively gotten better than the one before it and this one was not exception to the rule. The Confectioner’s Coup had a bit of it all; mystery, intrigue, suspense, fantasy, and just a sprinkle of romance to top it all off. Oh my god, this book was amazing! I could not put it down. It was filled with action, lies, deceit and betrayals. Wren manages to not get executed but ends up in more trouble in this book. Guild members are getting kidnapped and an army is at the gates of Maradis ready to invade. Negotiations for the accord are not going well and there is dissension within the guilds. War is imminent and everything is falling apart, a rebellion might be the only solution. I give The Confectioner's Coup (Confectioner Chronicles Book 2) by Claire Luana, 5 stars. Things just keep getting worse for Wren and her friends. There is an army on their city's doorstep. Now things are happening within the Guild. Guild members are disappearing. But who is behind it? Is it the from the army threatening to attack? Or is it their own king? What can they do to resolve all this madness? At what cost? I love this se I give The Confectioner's Coup (Confectioner Chronicles Book 2) by Claire Luana, 5 stars. I love this series, I have from the first book I read. I did not think it could get any better. But this book proved me wrong. It's absolutely incredible. This book is darker than the rest as more is happening. The story pulls you in right away. There is so much happening. The characters are changing, they are growing up quickly to keep up with what is happening. They also know what they believe in -- helping those they care about. This is such an intense book and you will be unable to put it down until you reach the end. Then you will quickly reach for the next book. I am once again no let down. This is the second book in this series and the third book including the prequel to the series that I have read. The author really has such a great way of grabbing the reader and keeping you at the edge of your seat. I really found myself getting lost in this magical confectioner's world she has created. This was the continued story of Wren and I loved it as much as the first part of this series. She just can't win when it comes to staying out of the line of fire with being framed for murder and getting out of that to now suspecting the king of being behind guild members being kidnapped and now the enemy has entered the city. There was some parts of this story that made me so angry and then parts that were so so sad. You don't really ever know what your gonna get when you open up one of this authors books and I love that. Can't wait for the next story in this series, I have so many questions about Hale and what his future holds as well as Wren and the Guild itself. I Love this series and I love this author and I highly recommend starting at the beginning and reading these books and let me also mention that the covers on these books are completely awesome!! This is the second book in the Confectioner Chronicles Series and I suggest reading Book 1 first as this picks up only a short time after the first story ends. As with book 1, THE CONFECTIONER'S COUP is full of well developed / well defined characters. There were a few times I was getting characters from the first book confused but there are simple explanations as to who is who which did not bog down the story. This story has a bit more twists and turns and isn't as shiny and bright as one would e This is the second book in the Confectioner Chronicles Series and I suggest reading Book 1 first as this picks up only a short time after the first story ends. This story has a bit more twists and turns and isn't as shiny and bright as one would expect. I think it's a perfect combination of dark and light - well balanced. There are characters I do not care for and that's what makes it interesting for me. I was anxious to see if the story would go "my way" so I kept turning the pages. I think this book would be appropriate for middle school and higher for those that like to read fantasy stories (not THOSE kinds of fantasies). What a great book! This fantasy novel is a continuation from the first Confectioner Chronicles. We are following again with Wren. Wren, for lack of a better word….is bored. She is always so busy, and after the events of the first book. Who could blame her? But be careful what you wish for. A hostile army begins to appear outside of the city and people are starting to worry that they will take seize of the city. Members of the Guild begin to go missing. Wren has her own suspicion of who is behind the disappearances of the Guild members. Wren enlists the help of her boyfriend and close friends to help her find the missing Guild members. I was so excited to start this book after loving the first book in the series and it was everything I wanted it to be and more. I have been so lucky to read a few books by this author now and each one has been an incredible read. Ms Luana really does have a talent for creating such unique storylines and characters - her attention to detail is excellent. I always feel like I am part of her stories and because of that attention to detail I can easily imagine what I am reading. This book definitely should be read after the first as it builds on the plot from the first story and the author adds another amazing layer to it! There were twists and turns everywhere and I honestly couldn’t turn the pages fast enough to try and find out what was going to happen next! I can’t wait to find out what happens next in the third book!! The Confectioner’s Coup is the second novel in the Confectioner Chronicles by Claire Luana. This is my fourth novel by this author. After surviving the ordeals from the first book, Wren is now trying to prove the King is to blame for sudden disappearances of some of the guild members including a new recruit. This new investigation takes her another journey with friends and foes. Will she be able to stop a rebellion? I really enjoyed this novel and was so excited to read this novel. Wren is such a s The Confectioner’s Coup is the second novel in the Confectioner Chronicles by Claire Luana. This is my fourth novel by this author. Wren is such a strong, relatable female character who has gone through so much since entering the Guild but still pushes through anything thrown at her. The POVs do change which was surprise but I enjoyed reading from the other voice once I got use their pace and tone. I am so in love with the covers. I look forward to seeing how this series ends. As if I wasn’t already invested in this series after the first book, The Confectioner’s Coup has me hooked and looking forward to reading more. I have really come to love Claire Luana’s style of writing, each story has so much to offer really making you feel every emotion. Not only is the storyline exciting and packed with twists and turns that kept me engaged from start to finish but the character development is also just as great. I have enjoyed learning more about Wren as the series progresses and seeing just what kind of chaos will find her next. As with the first book, The Confectioner’s Coup left me wanting more and anxious to see what is to come. Honestly looking forward to reading book number three of this unique, entertaining series. The Confectioners Coup by Claire Luana is the second book in the Confectioner Chronicles. This series ideally needs to be read in order as it follows the same character on her journey. This author effortlessly pulls you back into Wrens story and the troubles she is facing. With new enemies and a dangerous mission ahead of her Wren has to put her wits and courage to the test once more. This series for me keeps getting better. 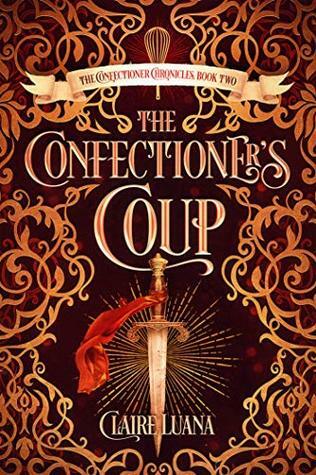 Each book is a new turn in the road and it is making this a very excitin The Confectioners Coup by Claire Luana is the second book in the Confectioner Chronicles. This series ideally needs to be read in order as it follows the same character on her journey. The Confectioners Coup is the second book in the Confectioner Chronicles series by Claire Luana. If you enjoyed the first book, then this book will not disappoint you at all. Get yourself ready to meet new characters which you will either like or dislike, but they help make this book enjoyable. I will say this book contains so much sadness and may take you on a roller coaster of emotions. But on saying that it has a few twists and turns that you want to keep turning the page. Book one is my favorite so far in this series, but I am looking forward to book three and a nicer ending. This is the second book in The Confectioner Chronicles and i loved it! I liked it even more than i liked the first one. This book kept me on the edge of my seat wondering what was going to happen next and it was great. This book has it all... Mystery, suspense, humor and of course a little bit of romance. I HIGHLY suggest reading these books in order to get the best reading experience because they shouldn't be read as standalones. I absolutely adore Wren. She is a fantastic main character and she's funny and strong. I really am looking forward to reading book number three so i can figure out what happens! Go get this series now! Happy Reading!